Metro is contemplating giving rail stations a makeover to make them brighter and more modern -- and the Bethesda station is set to test out several new design concepts at once. 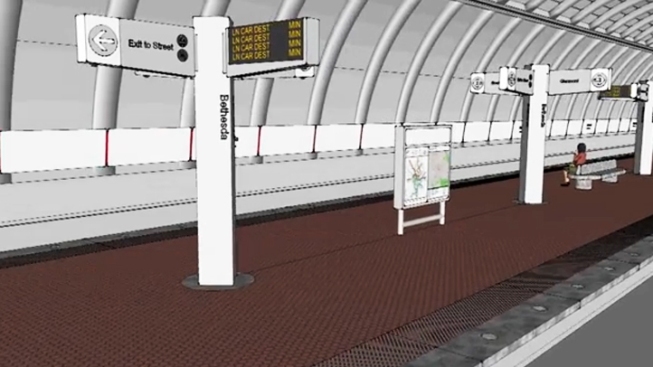 WMATA officials said Thursday that the proposed redesigned look would include stainless steel and light gray instead of brown, bright lights, and clear glass. It plans to sink $10 million into creating the prototype in the Bethesda station. One reason they chose Bethesda? Because riders often complain about the dim lighting, and Bethesda’s center platform is considered the hardest type of station to illuminate, Metro says in a video posted to YouTube. A new stairway from the mezzanine to the platform, where currently exists just a cut-out to look through. The transit agency will then decide how to incorporate the changes in Bethesda, which could be ready in 2015, to other stations throughout the system. Officials will learn what's popular and determine what improvements can be made, Metro General Manager Richard Sarles said. The new design would replace the existing look of the rail system, which was designed and constructed in the 1960s and 1970s.